Richard Clegg RDT, 1st Dental Sheffield, highlights the advantages of providing your clients with top quality Private Occlusal Rims. In these difficult times many Technicians and Laboratories are looking to increase their profitability by increasing their efficiency and producing more Private work at the expense of their less valuable NHS work. The latter can be achieved by either encouraging their existing clients to do more Private work or, probably more realistically, expanding their customer base by targeting new clients who are more interested in delivering Private work to their patients. Either way the quality of the work the Technician needs to deliver to the Dentist needs to be of a demonstrably higher standard. 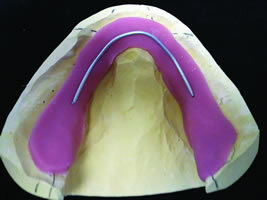 This can also offer other advantages to both the Dentist and Technician because it can increase their efficiency by saving both of them a significant amount of surgery and lab time, reducing the number of re-tries required and achieve a greater sense of value for money and overall satisfaction for their clients, the patient and Dentist respectively. If you provide Dentists with correctly shaped Occlusal Rims it will make it quicker and easier for them to select the correct mould of teeth and ensure that the function and phonetics of the final dentures will be correct. Rather than simply building my Private Occlusal Rims on a shellac or wax base I use a self curing or light curing acrylic base for both the upper and lower wax block. In the upper I remove the acrylic from around the area of the rugae and incisive papilla and fill this space with wax. Similarly I remove the acrylic from any areas where there are deep labial undercuts and block them out with wax to ensure that it is possible to remove the finished Occlusal Rims off the models afterwards. Once these acrylic bases have been laid down and waxed up over the rugae etc I add a pre-curved wax bite rim block. The wax bite rim blocks I use have already been preshaped to have the optimum dimensions for the majority of “normal” patients. 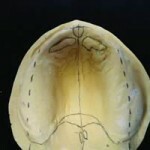 In the posterior region they are 10mm x 10mm in cross section which is just about the optimum size. Using preformed blocks saves time and also prevents the risk of porosity which may occur when sheets of wax are hand-rolled. I position them so that the labial border is in the optimum position for the anticipated amount of labial support I expect the Dentist will want to achieve. The wax rims should be placed where the natural teeth used to be. This needs to take into account that the maxilla atrophies inwards (centripetally), but the mandible atrophies outwards posteriorly (centifrugally) and inwards anteriorly. Therefore, in the posterior area of the upper Occlusal Rim the wax rim should be placed buccal to the ridge centre, and in the lower on or just lingual to the ridge centre. In the lower jaw the wax rim runs on a plane from the incisal edge to the middle of the retromolar triangle. 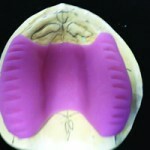 This forms the occlusal plane in the mandible, which is parallel to the model base and corresponds to Camper’s line. I then complete the waxing up using more wax. The peripheral margins of each rim should be positioned approximately 5mm short of the mucolabial (muco-buccal) and, in the lower, lingual folds. They should also cover the maxillary tuberosities and retromolar areas. The muscle attachments must remain free. Then I thin out the wax rims to about 6mm wide on the palatal and lingual surfaces starting at about the premolar/canine area. 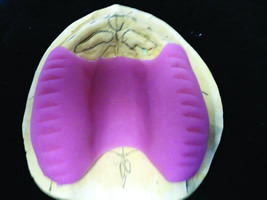 This produces a lingual space for the tongue so that the patient’s phonetics will be optimised. By thinning them out in this way I can save my clients a significant amount of surgery time and reduce the amount of re-tries we all have to endure. After they have been finished and polished, they are delivered to my clients in a padded box to avoid any risk of damage. This presentation also creates the appropriate finesse for Private work as far as the patient is concerned. I consider it money well spent. The Dentist is then responsible for modifying the amount for labial support required for individual patients, by extending or reducing the amount I’ve provided. However there is normally only a minimal amount of adjustment required, so again there is a significant time saving for the Dentist and patient. The Dentist is also responsible for adjusting the Occlusal Rims so that the patient can achieve the correct “f”, “s” and “t” sounds. 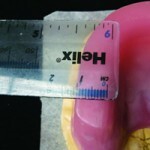 These are determined by obtaining the correct vertical height and tongue position at the canine/premolar area. For example, during “f” sounds the maxillary incisors should lightly touch the lower lips between the wet and dry area of the lips. In my opinion, the maximum a patient’s vertical dimension can be increased at any one time in full edentulous cases is by about 4mm. Anything greater than this simply cannot be tolerated by the vast majority of patients and simply means they would be unable to successfully wear the dentures, no matter how much time and effort are put into them by the Dentist and Technician. The “average” vertical height for most patients is normally about 40mm in total, with the occlusal plane of the lower teeth set just below the level of the tongue in order to allow an appropriate amount of Free Way Space. The correct vertical height is measured using a Willis Bite Gauge. 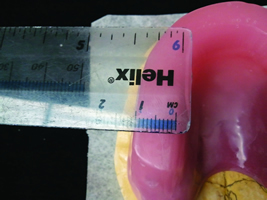 This means that for optimum aesthetic and occlusal results the trimmed Occlusal Rims will normally end up about 21mm high in the maxilla and 19mm high in the mandible. 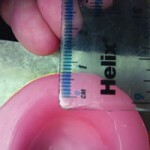 Therefore I produce my Occlusal Rims about 22mm high each. This normally provides more than enough additional height for the Dentist to adjust their heights in order to record the correct occlusion, but not so much that a lot of unnecessary time is wasted trimming them down. 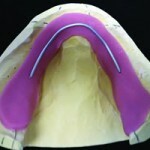 Again this saves both the Dentist and patient valuable surgery time. After the Dentist has finished recording the appropriate centric registration the Occlusal Rims should indicate the exact position of the artificial teeth in the denture set-up. 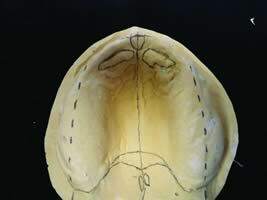 They should be shaped so that in both jaws their labial surfaces are positioned directly over the vestibule. They should be hollowed out lingually so that the tongue has adequate space for correct phonetics and masticatory function. 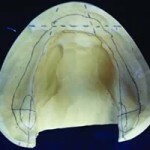 The bite stage is one of the most important stages in the fabrication of any removable or fixed prosthetic, so great emphasis on communication between the dental team and patient is very important and should be observed. The most common problems that arise in a poor bite registration are the lack of detailed information given to Technicians on such things as the patient’s psychological attitude towards having treatment. Some patients can be very nervous which can cause problems when chair time is short. There are other physiological and pathological notations that should be communicated to the Technician as master models do not always show clearly the condition of the soft tissue present i.e. hyperplasia and flabby fibrous ridges. The denture plate extension posteriorly needs to be extended fully, but if the patient has a sensitive gag-reflex this also needs investigating and marking on the primary model or secondary impression. The importance of each structure found within the oral cavity is learnt at a very early stage in dental anatomy, but the Palatine Fovia is key to establishing the junction between the hard and soft palate, and location of the vibrating line. 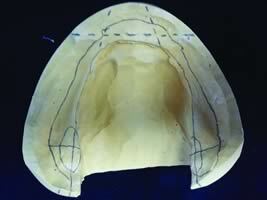 Thus the proper distal extension of the denture base plate can be established. This information isn’t always clearly visible on the working model so it is good practice to have this identified at the surgery. It should be understood that a bite registration appointment should take a minimum of one hour to complete; this surgery time should be incorporated into the treatment plan with the possibility to extend it if needed. 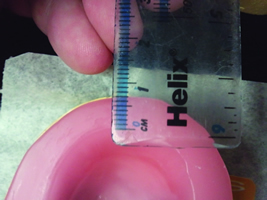 When fabricating my Private Occlusal Rims I particularly like using Kemdent wax products, which I purchase via Skillbond Direct, because they have a composition rigid enough to withstand heat when they are being formed, but do not distort when placed in the mouth during the Occlusal Registration itself. This rigid composition, allied to the fact that they are “sticky enough” to bond to artificial teeth during the set up stage, also means that I can set up the teeth in the Occlusal Rims themselves after the Occlusal Registration has been correctly recorded by the Dentist. This makes achieving the correct aesthetic and functional performance of the final prostheses easier and ultimately saves time. I find some other waxes are too rigid so that the teeth do not stick to them sufficiently well, running the risk of the teeth moving or even falling out during the try-in stage etc.